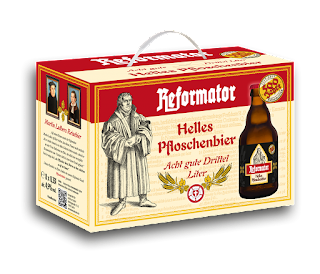 Above: A product from the LutherBiere line. Whoever first brewed beer has prepared a pest for Germany. I have prayed to God that he would destroy the whole growing industry. I have often pronounced a curse on the brewer. All Germany could live on the barley that is spoiled and turned into a curse by the brewer. The man who first brewed beer was a pest for Germany. Food must be dear in all our land, for the horses eat up all our oats, and the peasants drink up all our barley in the form of beer. I have survived the end of genuine beer, for it has now become small beer in every sense, and I have prayed to God that He might destroy the whole beer-brewing business, and the first beer-brewer I have often cursed. There is enough barley destroyed in the breweries to feed all Germany. The quote is typically undocumented. This source claims it is from "Martin Luther in his Table Talks." One of the most popular sources for quoting Luther is the Tischreden, in English known as the Table Talk. The Table Talk is a collection of second hand comments written down by Luther's friends and students, published after his death. It is a popular source because the comments are witty, and often stand alone, in fact they most often stand alone because the actual historical context of the purported remarks is unknown. 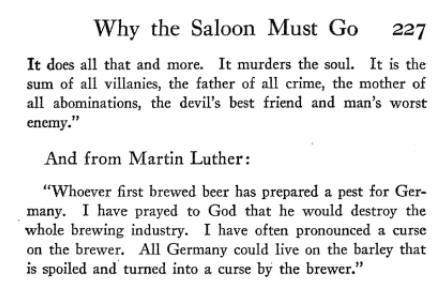 Notice how sparse the comment recorded by Cordatus actually is, basically repeating the sentiment about the first beer brewer being the pest of Germany. But like many of the Table Talk statements, multiple versions exist. Note the similarities in this Table Talk statement and this statement! The English edition of Luther's Works did include Schlaginhaufen's comment (WATR 1:23;1281). It can be found at LW 54:132. They also included the comment from Cordatus (WATR 3:5; 2810b), found at LW 54:172, which had been attached to another comment about Adam. Cordatus took Luther's comments from other sources. He later revised his Table Talk notes, making stylistic changes. Because of this, Luther's Works (English edition) includes only a small sampling of those statements compiled by Cordatus. “Adam was a very simple and unassuming man, [said Luther]. I don’t think he lighted candles. He didn’t know that the ox has suet in his body, for he wasn’t as yet slaughtering cattle. I wonder where he got the hides. Beyond this, Adam was undoubtedly a handsome man. He lived so long that he saw the eighth generation of his descendants, up to the time of Noah. No doubt he was a very sensible man and well practiced in a variety of trials. He lived most temperately and drank neither wine nor beer. Eating and drinking are not forbidden, but rather all food is a matter of freedom, even a modest drink for one’s pleasure. If you do not wish to conduct yourself this way, if you are going to go beyond this and be a born pig and guzzle beer and wine, then, if this cannot be stopped by the rulers, you must know that you cannot be saved. For God will not admit such piggish drinkers into the kingdom of heaven [cf. Gal. 5:19–21 ] (LW 51:293). Luther preached and wrote against drunkenness throughout his entire life with vigor and force. 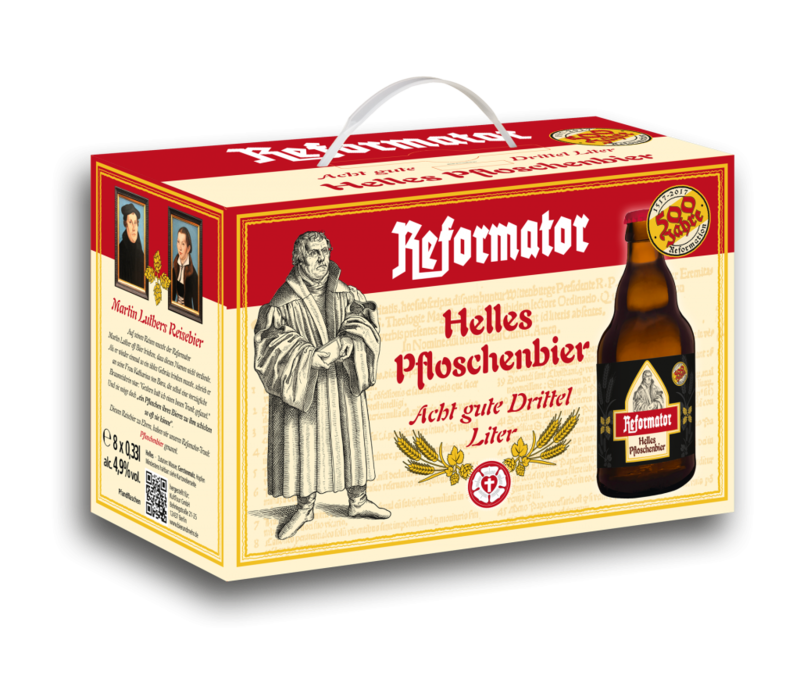 As biographer Heinrich Boehmer notes, “Luther attacked the craving for drink with word and pen more vigorously than any German of his time. He told even princes his opinion of it, in private and public, blamed the elector himself publicly for this vice, and read the elector’s courtiers an astonishingly drastic lecture” [Heinrich Boehmer, Luther and the Reformation in the Light of Modern Research (London: G. Bell and Sons LTD, 1930), 198]. 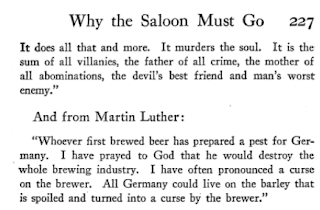 It appears to me that those in support of Prohibition took one Table Talk comment and ran with it, attempting to make Luther into something he was not. 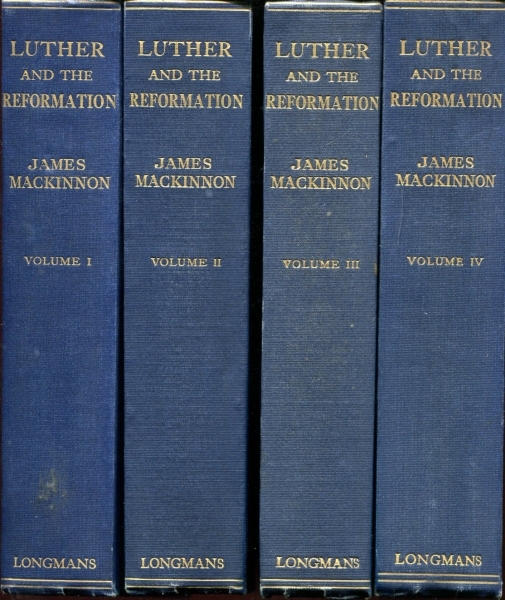 Here are pdf links to the four volume biography of Martin Luther from James MacKinnon. I found these volumes via this link. This set was one of the original biographies I used when I started researching the Reformation. I'm grateful someone has made them available online. 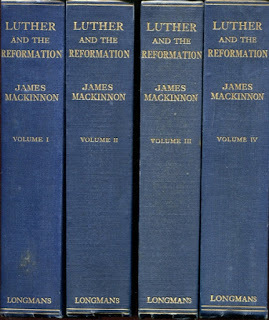 MacKinnon's work is valuable because he was fluent in understanding the Denifle / Grisar (Roman Catholic) distortion of Luther. These are good historical source volumes to have. Calvin was the Cruel and Unopposed Dictator of Geneva? The Oxford Dictionary of the Christian Church is said to have pronounced: "Calvin was the cruel and unopposed dictator of Geneva." Different versions of this citation are found in cyberspace, many attributing this opinion to this famous dictionary. In one curious mention, Leighton Flowers argues for the authenticity of the quote (and source) by referring to the authority of Christianity Today and that the same quote was used in "5 articles by Calvinistic brothers... while still standing in defense of Calvinistic soteriology and Calvin’s overall character." If all these pro-Calvin sources use this quote, it must be a legitimate quote and the official opinion of The Oxford Dictionary of the Christian Church. Dr. Flowers' argument is only partially correct. It's true, if a number of credible sources use the same information, that certainly is an important factor in determining validity. On the other hand, Flowers' argument is fundamentally flawed in that, simply because other sources (including favorable sources) use the quote, this doesn't necessarily prove the authenticity of the quote. Historical accuracy is not determined by taking a poll to see how many people are on the same page. What then of this quote? 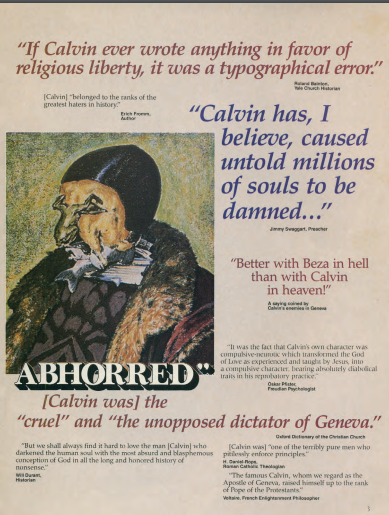 Did the respected Oxford Dictionary of the Christian Church really publish the exact sentence, "Calvin was the cruel and unopposed dictator of Geneva"? No, they did not. They published a sentence with some similar terms, but not an exact match to that being cited. Is this therefore a legitimate quote? I will argue their negative sentiment towards John Calvin may have been their opinion at one time, but no longer should it be attributed as the official position of The Oxford Dictionary of the Christian Church. Many cyber-occurrences of this quote simply cite it as coming from "The Oxford Dictionary of the Christian Church." I suspect Christian History Magazine played a significant role in disseminating this particular documentation. To the left is the actual page layout how the quote appeared in their issue dedicated to John Calvin. While Christian History Magazine is a helpful source for an easily digested overview of Christian history, their documentation is often horrendous. The majority of issues I've thumbed through hardly document anything in a meaningful way. The articles are clever, the layout is appealing, proper documentation though appears to be considered neither, so they typically leave the bulk of such tedium out. In his defense of the quote Leighton Flowers found better documentation in this link: "‘John Calvin’ in The Oxford Dictionary of the Christian Church, edited by FL Cross and EA Livingstone, (OUP: New York, 1974, 2nd ed. ), p. 223." Flowers posted this reference back in 2017. Had I been involved in this discussion, I would have asked Dr. Flowers if he had actually read page 223 in The Oxford Dictionary of the Christian Church to confirm this quote. I suspect he would have either said "no," or quickly done a web-search to see if the book was easily accessible on-line. In fact, not owning this volume, the very first thing I did was to see if The Oxford Dictionary of the Christian Church was online. Through the magic of Google Books and the preview feature at Amazon, it is possible to view the bulk of the John Calvin entry in The Oxford Dictionary of the Christian Church. Via Google, a limited preview of the 2005 edition is available. One thing to notice immediately is that the Calvin entry occurs on different pages in the 2005 edition (pp. 268-270), not page 223. More importantly, the striking thing to notice is that the quote in question does not appear in the "John Calvin" entry in these online versions. Searches of the complete book of key terms in the sentence do not return any positive hits from any of the pages in this book. I was not not the first person to realize this. The person criticizing Leighton Flowers on this quote went so far as to refer to it as one of many "fake citations," also saying, "After some research I could find no such quote in any edition of ODCC dating back to 1997." I likewise searched through a number of online editions and did not locate anything similar to "Calvin was the cruel and unopposed dictator of Geneva." It's completely missing. It certainly does seem like a fake citation! Calvin, John (1509–64), French reformer and theologian. Born at Noyon in Picardy, Calvin appears to have been intended for an ecclesiastical career; he obtained his first benefice and received the *tonsure at the age of 12 through the patronage of the Bp. of Noyon. Sometime between 1521 and 1523 he went to Paris, studying arts at the Collège de Montaigu, presumably with a view to proceeding to the study of theology, but from 1528 he studied civil law at Orléans and later at Bourges. Here he became familiar with the ideas of Humanism, and possibly (through the influence of Melchior Wolmar, who taught him Greek) those of M. *Luther. After the death of his father in 1531, Calvin returned to Paris to study letters, publishing his commentary on *Seneca’s De Clementia in 1532. Calvin’s growing sympathy with the Reformation movement led to his flight from Paris in Nov. 1533, following the outcry against the address delivered by the Rector of the University of Paris, Nicholas Cop, to mark the beginning of the academic year. This oration, generally thought to have been composed by Calvin, shows obvious affinities with both *Erasmus and Luther. In 1534 Calvin resigned his ecclesiastical benefices, and, as the religious situation in France deteriorated and the threat of persecution grew, fled to Basle in 1535. The first (Latin) edition of his *Institutes (q.v.) was published there in March 1536. On passing through *Geneva in July 1536, he was persuaded by G. *Farel to remain there and assist in organizing the Reformation in the city. In Jan. 1537 Calvin and Farel drew up articles regulating the organization of the Church and worship. However, strong internal opposition to their imposition of ecclesiastical discipline arose, centering on the imposition of a confession of faith and the use of excommunication as an instrument of social policy. Meanwhile Geneva was coming under increasing pressure from its powerful neighbor and ally, Berne. On Easter Day 1538, Calvin publicly defied the city council’s explicit instructions to conform to the (*Zwinglian) religious practices of Berne and was immediately ordered to leave the city. Accepting an invitation from M. *Bucer, Calvin spent the next three years as pastor to the French congregation at Strasbourg. This period proved formative for Calvin, allowing him insights into the management of civil and ecclesiastical affairs denied him in the more provincial setting of Geneva. During this period he produced an enlarged edition of the Institutes (1539), in which the influence of Bucer is particularly evident in the discussion of the Church; a commentary on Romans (1539); the first French edition of the Institutes (1541); and the celebrated Epistle to Cardinal *Sadoleto, then endeavoring to bring Geneva back to the RC Church, in which Calvin vigorously defended the principles of the Reformation. In Aug. 1540 he married Idelette de Bure, a widow. In Sept. 1541 Calvin accepted the invitation of the city council to return to Geneva and during the next 14 years devoted himself to establishing a theocratic regime. His ‘Ecclesiastical Ordinances’, which again drew heavily on the views of Bucer, were adopted by the city council in Nov. 1541. These distinguished four ministries within the Church: pastors, doctors, elders, and deacons. Other reforming measures included the introduction of vernacular catechisms and liturgy. Ecclesiastical discipline was placed in the hands of a *consistory, consisting of 12 elders and some pastors, which sought to enforce morality through the threat of temporary excommunication; among other things it prohibited such pleasures as dancing and gambling. Popular reaction against this moral control was considerable, culminating in the victory of an anti-Calvin party in the city elections of 1548. This was assisted by popular discontent arising from the large number of Protestant emigrés, largely from France, who sought refuge in Geneva. The difficulties of Calvin’s public life were compounded by personal tragedy: his wife died in March 1549, leaving him to care for her two children by her previous marriage (her only child by Calvin died shortly after his birth in 1542). The trial and execution of M. *Servetus (1553), however, served to undermine the authority of the city council, and by 1555 effective opposition to Calvin had ceased. From this time onwards Calvin was virtually unimpeded in his promotion of the Reformation in Geneva and elsewhere. His extensive commentaries on the NT were supplemented by a series dealing with OT works. The establishment of the *Genevan Academy (1559) provided an international forum for the propagation of Calvin’s ideas. His influence upon the French Protestant movement (see huguenots) was enormous, Geneva being the chief source of pastors for French Protestant congregations. The publication of French editions of the Institutes exercised as great an influence over the formation of the French language itself as over French Protestantism. Earlier, between 1549 and 1553, Calvin addressed a series of letters to *Edward VI and Protector *Somerset, suggesting reforms in the English Church which would retain an episcopal form of government; from 1555 onwards he offered refuge in Geneva to Protestant exiles from England. In 1559 Calvin was finally made a citizen of Geneva. Until then his status had been that of a legal resident alien in the employment of the city council. He did not have access to the decision-making bodies in the city, save for the appointment of pastors and the regulation of morals. What authority he possessed appears to have derived largely from his personality and his influence as a religious teacher and preacher; even this authority, however, was constantly challenged by the city council until 1555. Calvin was a more rigorous and logical thinker than Luther, considerably more sympathetic to the insights and methods of Humanism, and much more aware of the importance of organization, both of ideas and institutions. During his time at Geneva, his reputation and influence as an ecclesiastical statesman, as a religious controversialist, educationalist, and author was widespread. His theological insight, his exegetical talents, his knowledge of languages, his precision, and his clear and pithy style, made him the most influential writer among the reformers. His Institutes are still regarded as one of the most important literary and theological works of the period. In CW, he is commemorated on 26 May. The standard edn. of Calvin’s works is that by H. W. Baum, E. Cunitz, E. Reuss, P. Lobstein, and A. Erichson (Corpus Reformatorum, 29–87; 59 vols., Brunswick, 1863–1900). Opera Selecta, ed. P. Barth and W. Niesel (5 vols., Munich, 1926–36). Many of his works were tr. into Eng. in the 19th cent. under the auspices of the Calvin Translation Society. The collection of Tracts and Treatises by H. Beveridge (1844) was repr., with notes and introd. by T. F. Torrance (3 vols., 1958). Other modern trs. into Eng. incl. that of his Theological Treatises by J. K. S. Reid (Library of Christian Classics, 22; 1954), of a selection of his Commentaries by J. Haroutunian (ibid. 23; 1958), of his Institutes by F. L. Battles, ed. J. T. McNeill (ibid. 20–1; 1961), of his Commentaries on the NT by T. H. L. Parker and others, ed. D. W. Torrance and T. F. Torrance (1959 ff. ), and of his Comm. on Seneca’s De Clementia by F. L. Battles and A. M. Huglo (Leiden, 1969). The Lives of Calvin by T. *Beza, orig. prefixed to Calvin’s Comm. on Joshua (posthumously pub., Geneva, 1564; Eng. tr. of the Life, London, 1564), and that prefixed to the edn. of Calvin’s letters pub. Geneva, 1575, together with that attributed to Beza (the work of Nicolas Colladon) prefixed to 2nd edn. of the Comm. on Joshua (Lyons, 1565), are pr. among his works. Modern studies dealing with Calvin generally incl. E. Doumergue, Jean Calvin: Les hommes et les choses de son temps (5 vols., 1899–1917; comprehensive but uncrit. ); J. Rilliet, Calvin 1509–1564 (Paris, 1963); A. Ganoczy, Le Jeune Calvin: Genèse et évolution de sa vocation réformatrice (Veröffentlichungen des Instituts für europäische Geschichte Mainz, 40; Wiesbaden, 1966; Eng. tr., Philadelphia, 1987; Edinburgh, 1988); T. H. L. Parker, John Calvin: A Biography (1975); W. J. Bouwsma, John Calvin: A Sixteenth-Century Portrait (New York and Oxford, 1988); A. E. McGrath, A Life of John Calvin (Oxford, 1990); B. Cottret, Calvin: biographie (; Eng. tr., Grand Rapids and Edinburgh, 2000). Works on different aspects incl. E. Choisy, La Théocratie à Genève au temps de Calvin (Geneva ); W. Niesel, Die Theologie Calvins (Munich, 1938; 2nd edn., 1957; Eng. tr., 1956); J. D. Benoît, Calvin, directeur des âmes ; T. F. Torrance, Calvin’s Doctrine of Man (1949); id., Kingdom and Church: A Study in the Theology of the Reformation (1956), pp. 90–164; F. Wendel, Calvin: Sources et évolution de sa pensée religieuse (Études d’histoire et de philosophie religieuses publiées par la faculté de théologie protestante de l’université de Strasbourg, 41; 1950; Eng. tr., 1963); E. A. Dowey, The Knowledge of God in Calvin’s Theology (New York, 1952); P. [M.] van Buren, Christ in Our Place: The Substitutionary Character of Calvin’s Doctrine of Reconciliation (1957); R. S. Wallace, Calvin’s Doctrine of the Christian Life (1959); W. Nijenhuis, Calvinus Oecumenicus: Calvijn en de Eenheid der Kerk in het Licht van zijn Briefwisseling (Kirkhistorische Studien, 3; 1959); J. *Moltmann (ed. ), Calvin-Studien 1959 (Neukirchen, 1960); H. J. Forstman, Word and Spirit: Calvin’s Doctrine of Biblical Authority (Stanford, Calif., 1962); K. (McDonnell, OSB, John Calvin, the Church, and the Eucharist (Princeton, NJ, 1967); T. H. L. Parker, Calvin’s New Testament Commentaries (1971); id., Calvin’s Old Testament Commentaries (Edinburgh, 1986); H. Höpfl, The Christian Polity of John Calvin (Cambridge, 1982); S. E. Schreiner, The Theater of his Glory: Nature and the Natural Order in the Thought of John Calvin (Durham, NC ); R. C. Zachman, The Assurance of Faith: Conscience in the Theology of Martin Luther and John Calvin (Minneapolis ), pp. 91–253. P. W. Butin, Revelation, Redemption and Response: Calvin’s Trinitarian Understanding of the Divine-Human Relationship (New York and Oxford, 1995); D. C. Steinmetz, Calvin in Context (ibid. 1995). R. Peter and J.-F. Gilmont, Bibliotheca Calviniana: Les œuvres de Jean Calvin publiées au XVIe siècle (Travaux d’Humanisme et Renaissance, 255 and 281; 1991–4). A. Erichson, Bibliographia Calviniana: Catalogus Chronologicus Operum Calvini (Berlin, 1900); W. Niesel, Calvin-Bibliographie 1901–1959 (Munich, 1961), D. Kempff, A Bibliography of Calviniana 1959–1974 (Studies in Medieval and Reformation Thought, 15; Leiden, 1975). J. N. Tylenda and P. De Klerk, ‘Calvin Bibliography 1960–1970’, Calvin Theological Journal, 6 (1971), pp. 156–93; an annual bibl. is included in subsequent issues of the Journal. See also bibls. to calvinism and institutes. Cross, F. L., and Livingstone, E. A. (Eds.). (2005). 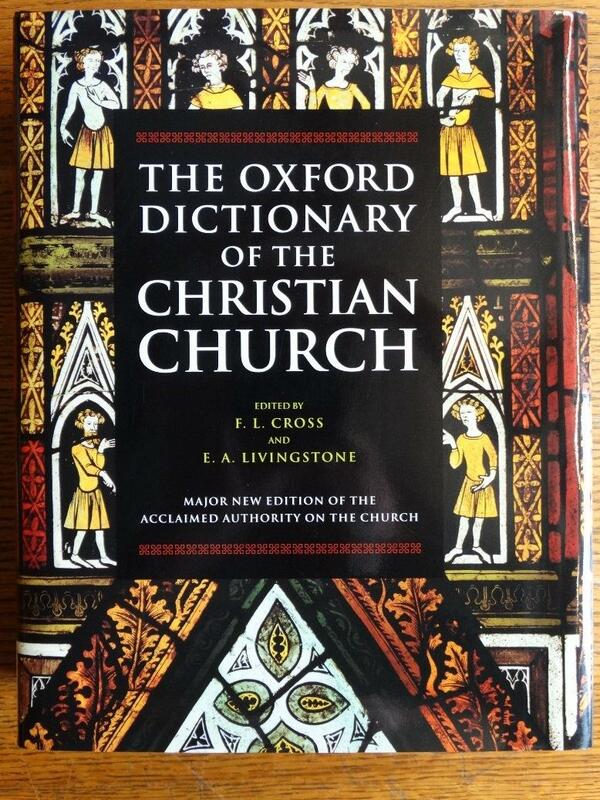 In The Oxford dictionary of the Christian Church (3rd ed. rev., pp. 268–270). Oxford; New York: Oxford University Press. There is nothing overtly condescending about Calvin in the above. One wonders how anyone could possibly say The Oxford Dictionary of the Christian Church referred to Calvin as a "cruel" and "unopposed dictator." I decided to take this a step further and pursue the documentation provided via Leighton Flowers, so I purchased the 1974 edition. As it turns out, there are some crucial and drastic differences between the 2005 edition and the 1974 edition. The latest edition is a revision of the second edition from 1974. The reason why the page numbers don't match is because the later revision expanded the content by adding new material. E.A. Livingstone explained in the 2005 edition, that to "reflect events and shifts in scholarly opinion over the last eight years or so... In some cases I commissioned completely new articles..."
He was appointed preacher and professor of theology and in 1536 published his Articuli de Regimine Ecclesiae. They contained severe regulations concerning admission to the Lord's Supper and required from all Genevan citizens a profession of faith approved by the town council, the refusal of which was to be punished by exile (222). In 1541 Calvin returned to Geneva , where his party had gained the upper hand, and during the next 14 years he devoted himself to establishing a theocratic regime on OT lines. this was effected by a series of Ordinances which placed the government of the new Church in the hands of four classes of men... which, under Calvin, was chiefly a tribunal of morals. It wielded the power of excommunication and had far-reaching powers over the private lives of citizens. These were enforced by new legislation, which inflicted severe punishments even for purely religious offenses and prohibited all pleasures such as dancing and games (223). The article then mentions the Libertine party "which Calvin succeeded in overcoming by force," (223) and how Gruet, Monnet, and Servetus were either tortured or executed. Not long thereafter comes the quote under scrutiny: "From 1555 to his death he was the unopposed dictator of Geneva, which, through him, had become a city of the strictest morality." The article goes on to describe "his vindictiveness and his claim to be the supreme authority to decide what is true Christianity and what is not was resented even by his many followers" (223). The actual quote is "From 1555 to his death he was the unopposed dictator of Geneva, which, through him, had become a city of the strictest morality." This is certainly different than "Calvin was the cruel and unopposed dictator of Geneva." Missing particularly is the word "cruel" (this word does not appear anywhere in the 1974 entry). I suspect someone originally only was citing the ODCC saying "unopposed dictator of Geneva," and then someone after that created the version of this sentence attributing its entirety to the ODCC. Perhaps it was Christian History Magazine? Their exact statement was "[Calvin was] the 'cruel' and 'the unopposed dictator of Geneva'. " They published their issue on Calvin in 1986. If they weren't the culprit, they certainly helped in perpetuating this somewhat fake citation. When Professor Paul Woolley reviewed the first edition of the Dictionary in this Journal, he critiqued three entries in particular: one on millennarianism and two on Calvin and Calvinism. The erroneous definition of millennarianism in the first edition has been corrected in the second. Unhappily no such improvement can be seen in the entries on Calvin and Calvinism. While the bibliographies, particularly on Calvin, have been greatly improved and updated, the articles themselves have not been changed at all. The same gross misrepresentations of Calvin and Calvinism are simply repeated. Whoever contributed these articles should have read the good books listed in the bibliographies. The first article describes Calvin as having “devoted himself to establishing a theocratic regime on Old Testament lines,” and having “prohibited all pleasures such as dancing and games” (p. 223). Calvin is called “the unopposed dictator of Geneva” after 1555 and as lacking “the human attractiveness of Luther.” (Ibid.) The theology of Calvinism is summarized as “extreme emphasis on the omnipotence of God, which takes no account of His justice and mercy” (p. 224). Reformed church polity is described as a “theocratic polity, subjecting the State to the Church” (Ibid.). Calvin’s eucharistic theology is “at times ambiguous, but his thought seems to tend more in the direction of Zwingli” (Ibid.). None of these statements is true and indicate one place in the Dictionary where generalizations long refuted are allowed to stand. Clearly the long years of distortion and misunderstanding are not over for John Calvin or his theological descendants [Robert, G. W. (1976). 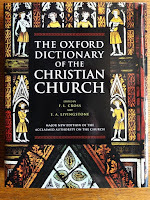 Review of The Oxford Dictionary of the Christian Church Edited by F. L. Cross. Westminster Theological Journal, 39(1), 202–203]. The Oxford Dictionary of the Christian Church rewrote their entry on Calvin, so their earlier opinion that Calvin was an "unopposed dictator" is no longer accurate. Leighton Flowers should have gone the extra few steps to verify this quote instead of defending his "credentials" and complaining about if he or his detractor was using "proper research methodology." This quote is yet another example of: just because it's on the Internet, it's not necessarily true. Calvin Beheaded a Child in Geneva? I recently came across a detailed description of Calvin's Geneva from historian Will Durant's book, The Reformation. Durant doesn't pull any punches. He provides a number of pages describing Geneva as an horrific place to reside, unbearable terrors that resulted from the despotic tyrant, John Calvin. If anyone is under the illusion that Durant's vague belief in God and rejection of organized religion equipped him to provide a fair and unbiased historical account of the life of John Calvin, this historian concluded his coverage of Calvin with, "...we shall always find it hard to love the man who darkened the human soul with the most absurd and blasphemous conception of God in all the long and honored history of nonsense" [Will Durant, The Reformation: The Story of Civilization (New York: Simon and Schuster, 1957), 490]. That conclusion sums up well Durant's treatment of Calvin. Later in his Dual Autobiography, he and his wife jab the Reformation's seeming rejection of the Renaissance "as pagan" and a reversion "to the gloomy theology of saint Paul and Saint Augustine, leading to the predestinarianism of Calvin and Knox, the Puritan regime, and the replacement of papal authority with the authoritarianism of the state in religion in Germany and Great Britain." 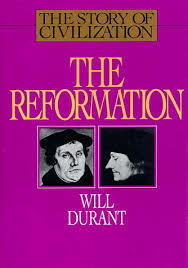 Durant did not hide the fact that he was not sympathetic to either Calvin or the Reformation. To speak disrespectfully of Calvin or the clergy was a crime. A first violation of these ordinances was punished with a reprimand, further violation with fines, persistent violation with imprisonment or banishment. Fornication was to be punished with exile or drowning; adultery, blasphemy, or idolatry, with death. In one extraordinary instance a child was beheaded for striking its parents (link). Notice how Durant's thoughts flow: from the crime of speaking words against Calvin, linked to severe punishment for sexual crimes, then to the beheading of a child, all the direct result of John Calvin. While the last statement will be our main focus, of the sentences here selected leading up to it, Durant provides documentation only for the first, citing this secondary source, which says only, “…to laugh at Calvin’s sermons, or to have spoken hot words of him in the street, was a crime…” This source provides no documentation for the assertion. That's typical of Durant's historical work. Often, primary materials allude his conclusions. He simply cites some other historian making an undocumented assertion. Here, Durant's historical trail dead-ends at a secondary source merely making an undocumented claim. Given that it's almost impossible in our modern age to examine the subject, "John Calvin" without immediately being bombarded with Calvin's involvement with the execution of Michael Servetus, how is it that, according to Durant, there was an "extraordinary instance" in which Calvin had a child beheaded, and that account isn't center-stage, usurping the Servetus incident? It sounds outrageous: Calvin had a child executed for simply striking their parents, and that's not more despicable than Calvin having a grown man executed for heresy? Doesn't the execution of a child typically have more societal emotional capital? Something doesn't add up here. Two things are especially to be noticed in the holy reign of terror which Calvin established and left behind him as a legacy to Geneva: first, the vast extension given to the idea of crime, and next, the worse than Draconian severity of the punishments inflicted. Adultery was repeatedly punished with death. A child was beheaded for having struck father and mother. Banishment, imprisonment, in some cases drowning, were penalties inflicted on unchastity. Similar to the previous assertions, this author does not document his claims. It may be Beard relied on the "Registers of the city of Geneva" (which is mentioned in a footnote at the bottom of the page), or it may be this author simply borrowed the fact from another secondary source. Durant may have realized this lack of primary evidence and actually provided another source, one of a much better pedigree: Phillip Schaff's History of the Christian Church. In describing "the most striking cases of discipline" in Geneva, Schaff launches into numerous examples, including, "A girl was beheaded for striking her parents, to vindicate the dignity of the fifth commandment" (link). Schaff though doesn't document this either. Later on in the same section Schaff mentions the Genevan Registers, but it appears to be for a different example. Once again, Durant's trail of facts reaches a dead-end for anyone venturing deep into history. Notice Babinski made an effort to track down where Schaff got his information from. Babinski says Schaff may have taken the information directly from the Registers of the Council of Geneva (more on this source later). In the literature of source material section, Schaff doesn't directly cite the Registers (but he does reference them in his footnotes). The next source, Lʼeglise et lʼetat a Geneve du vivant de Calvin. Etude dʼhistoire politico-ecclesiastique is available here. Babinski mentions specifically "pp. 92" of the 1867 edition, but there doesn't appear to be anything remotely relevant to the story in this book, nor specifically on page 92. Babinski simply is repeating the reference as Schaff noted it, that the book is 92 pages long. Babinski then directs his readers to compare this source with seven volumes of "Histoire du people de Geneve depuis la reforme jusquʼa lʼescalade." I'm not sure how comparing a 92 page book to seven volumes is supposed to make this child's beheading more clear. The reason why is Babinski's "Compare also his..." is what Schaff wrote in his literature on the subject section, "Comp. also his..." Even though Babinski is quoting Schaff directly, the narrow focus of this beheaded child is getting obfuscated by Babinski's presentation of Schaff's basic bibliography of the literature about sixteenth century Geneva. Babinski is correct, some of these massive archives can be searched. He's correct that Robert Kingdon released the detailed Registers of the Consistory of Geneva in the Time of Calvin Volume 1: 1542-1544 (Grand Rapids:William B. Eerdmans Publishing company, 1996). It's an invaluable English reference, but unfortunately, I don't think the English version ever made it past volume one after Kingdon's death in 2010. Hathi Trust though lists thirteen volumes of the Genevan registers in French. The relevant volume would be volume 3 which covers the years 1565-1574. I searched a number of key terms (including, "Philippe Deville," "Philippe de Ville," "Philippe de la Ville, Philippe la ville" "décapité," to name a few). I did not come across anything relevant. In full-disclosure, I do not have physical access to these French volumes. I'm relying on online search engines from Google Books and Hathi Trust. I appreciate that Babinksi mentions the discrepancy in the accounts, that it could either be a boy or a girl (this source claims Philippe Deville was female). There are though some other interesting details if one combines the accounts presented (and also assumes all the accounts are of the same historical event). Schaff adds the beheading took place "to vindicate the dignity of the fifth commandment." While this may have been the actual reason, it also could simply be Schaff's added comment or inference rather than something specifically noted in the Genevan records about this incident. The (unknown) English translation of Picot says it was not simply striking of the parents, but rather a beating of a father and step-mother. It makes one wonder exactly how old this child was that it beat both parents. This "beating" should at least rule out that it was a young child having a temper tantrum "striking" the parents in adolescent defiance. Even if it was an older teenager, it would not justify the death penalty in our day and culture, but it does make one wonder exactly what the other details may have been to provoke such a harsh sentence in that time period. How severe was this beating? If all these historians are describing the same event, there is one blatant fact mentioned by Paul Henry and Jean Picot that, for some unknown reason, Will Durant, Charles Beard, and Philip Schaff left out. It was also a fact mentioned but downplayed by Mr. Babinski: the year of the incident: 1568, in which some of the accounts say the beheading took place. What was John Calvin, the despotic tyrant doing in 1568? Was he staring down the child in Genevan court as a prosecutor, boldly proclaiming God's law was broken and the child must be punished with death? Was he watching the beheading of a child for breaking God's law? No, Calvin was at rest in his grave. He died May 27, 1564. If 1568 is the correct year, the best Calvin's detractors can do with this event is to argue the beheading was the result of Calvin's earlier influence in Geneva. This connection would need to be proven as a necessary connection from the historical record, not simply assumed (post hoc ergo propter hoc). Did Geneva behead Philippe Deville in 1568? Despite not finding any specific corroborating primary evidence, I assume they did. As to the specifics, and why they invoked the death penalty, I don't know. Yes, I think Geneva went overboard with discipline, yes there were unfortunate atrocities committed by the state; yes Calvin played his part in both until his death in 1564. But, Geneva played its part in the progression of piety and practice away from Rome, and of eventually separating the church from the state (which took a long time!). There is a tendency to think that once the Bible was made central in the church and the Papacy was defanged, all of the medieval worldview and practices would immediately fall away. No, this took time. Geneva demonstrates the dissonance of a church seeking to reform according to the Bible and still function with aspects of the medieval structure of government. It didn't work. Here were some other sources mentioning the 1568 beheaded child. More will be added as I come across them. "Le manque de respect aux parents constitue alors une atteinte à la loi sur laquelle il n'est pas question de transiger :un enfant du village de Genthod, Damian, fou de colère, insulte sa mère: «Diablesse! diablesse!» en lui jetant des pierres. Il est fouetté publiquement, pendu à une potence et n'échappe à la mort qu'en raison de son jeune âge.Son aîné, Philippe de Ville, est décapité pour avoir battu père et mère. Son aîné, Philippe de Ville, est décapité pour avoir battu père et mère" (link). "En 1568, Philippe Deville fut décapité pour avoir battu son père et sa belle-mère" (link). "In 1568 Philippe Deville was beheaded for striking his father, and the year before Antonia Sambuzide was condemned to prison for taking her husband by the beard" (link). "To understand what the word 'severity' means, let it be added that certain men who laughed during a sermon were imprisoned for three days; another person had to do public penance for neglecting communion on Whit-Sunday; a girl was beheaded for striking her parents; several women were imprisoned for dancing; and a lady was expelled from the city for expressing sympathy with the 'libertines,' and abusing Calvin and the Consistory" (link). "Calvin allowed a girl to be beheaded (for the heinous crime of striking her parents) during his reign of terror in Geneva 400 years ago. This atrocity is not exactly a secret; it is soberly reported by leading historians; but it is the sort of fact that is not taught." (link).